From an alarm clock waking you up in the morning to turning off the light at night, science and technology have shaped our understanding of our environment. 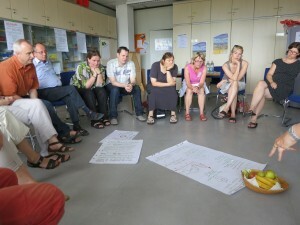 In the workplace, we gather and use information to inform practice and behaviour. School practical work can be contextualised within applications of industry, health care and / or research to enable students to better understand the reach of science in everyday life. Making lifestyle decisions frequently draws on scientific understanding and evaluating evidence. For example, why do we need to be careful about the use of antibiotics, overfishing, disposing of garden or household chemicals? Road safety measures, crash helmets and different fuels have been developed by industries and people working in these areas to improve safety on the roads. Scientific evidence has been used to guide regulatory powers to protect citizens, populations, and the environment. For example, the causative link between smoking and lung cancer took a long time to be accepted by the medical profession and the public in general. ‘Passive’ smoking is seen as more of a problem in some workplaces and countries than in others – it might be opportune for teachers to work with students to explore the reasons and evidence for some of the claims made. Where scientific competences for the workplace have been identified it is clear that they reflect a greater emphasis on processes. For example, Hurd (1998) in looking at the way these had been defined by the Department of Labor in the US, noted the key ones listed as being: ‘dealing with problems that result from an integration of science, society, technology and self’; ‘uses procedures or methods characteristic of the contemporary practice of science, such as team work’; ‘knows and can use appropriate scientific concepts that ramify most widely in everyday life’; ‘recognizes that there is no one method that represents the practice of science or the workplace’; and ‘recognizes continuous changes in the framework of the sciences’. This list is similar to some of the ones seen in more recent documents focused on developments internationally. However, as it is not easy to formally assess such competences through current school curriculum assessment, they have tended to be less well addressed, leading to the emphasis remaining on science content rather than process. This tool illustrates what science looks like when being used in just a few work-places. You can use this tool with your group to develop some insight into this issue. It may be best to consider this question before thinking about how to connect classroom learning of science to the world of work. Hurd, P. D. (1998) Linking Science to the Workplace. Journal of Science Education and Technology, 7(4), 329-335. OECD (2006) Assessing scientific, reading and mathematical literacy: A framework for PISA 2006. Paris: OECD. Royal Society for Arts (1986) Education for capability. Windsor, Berkshire: NFER-Nelson.